In 2014, Dunedin continued pushing the boundaries of urban cycling in New Zealand, but there have been substantial growing pains as the city, and New Zealand at large, tries to figure out how to do cycling infrastructure. The fine human specimens volunteering for Spokes Dunedin have once again done a great job with another busy year. Some of the highlights include instigating an acceleration of the Portobello Road widening project; lots of site visits and meetings with council staff; working with the Harbourside Precinct group to find a viable solution to the Roberts/Wharf intersection; working with the AA, council staff, and affected property owners to find a better design for Portobello Road between Portsmouth Drive and Andy Bay Road; and representing Dunedin cyclists at the national Cycle Safety summits and at meetings with NZTA in Wellington. 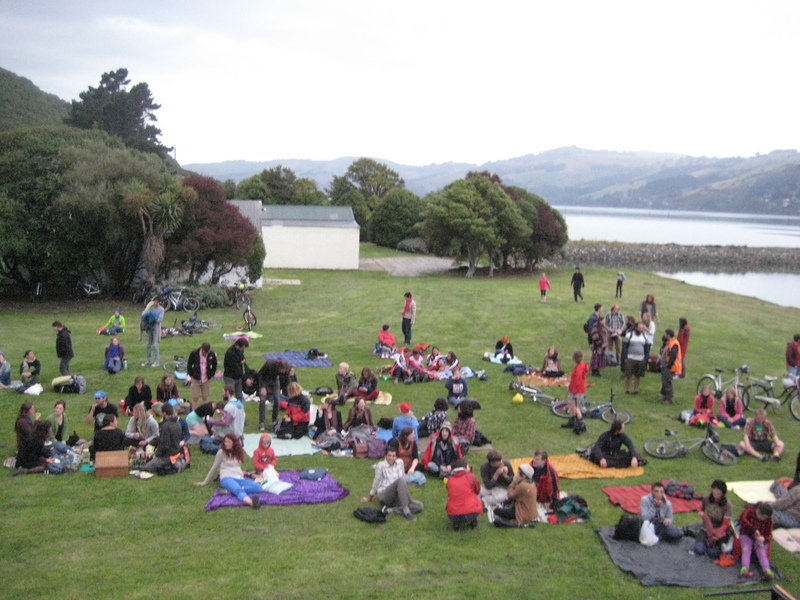 Around 75 people turned out for the first SPOKES Dunedin bike-in movie. We’re planning to do it again this summer! 2014 was a good year for Spokes love, with a bike-in movie by the harbour, wintertime bike raves (so on for winter 2015! ), and a cruisy ride around town on World Car Free Day. 2014 also saw wide recognition for efforts at making Dunedin’s streets sweet for bikes. 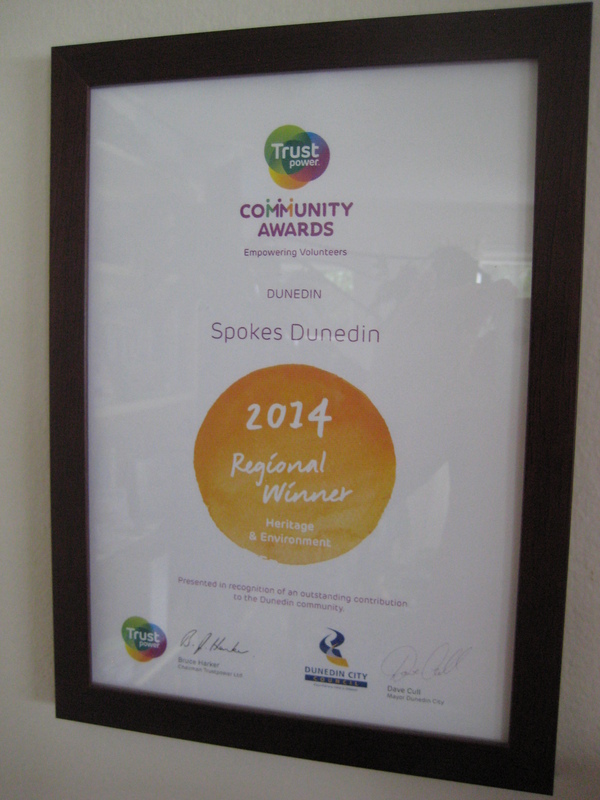 Spokes Dunedin was awarded a 2014 Trustpower Community Award for Heritage and Environment for our efforts at making Dunedin a more human city and I was a finalist for the “New Zealand Cycle Champion” Cycle Friendly Award. Our good friends at The Crooked Spoke DIY bike shop also picked up a Trustpower award, and Dunedin was a finalist in several categories of the Cycle Friendly Awards, with the Dunedin City Councillors bringing home the “Greatest commitment by a public body” award. Accelerated completion of Portobello Road widening is looking good. The most notable success of 2014 concerns the Portobello Road widening project. Hundreds of Broad Bay and Portobello residents made annual plan submissions favouring completion of their end first, while hundreds more cyclists and other city residents favoured completion of the city end first. With such broad desire to see the project complete, Spokes Dunedin and the Peninsula Board together suggested that the best solution would be to accelerate completion of the entire project. Councillor Richard Thomson championed an investigation of this suggestion, which found that it is possible to complete the entire project within 3 years instead of 10, and save $3 million at the same time! On the other side of the harbour, the shared path to Port Chalmers has received funding for the next design stage. Construction hinges on the project gaining funding during the 2015-2018 NZTA funding cycle. Fingers crossed! 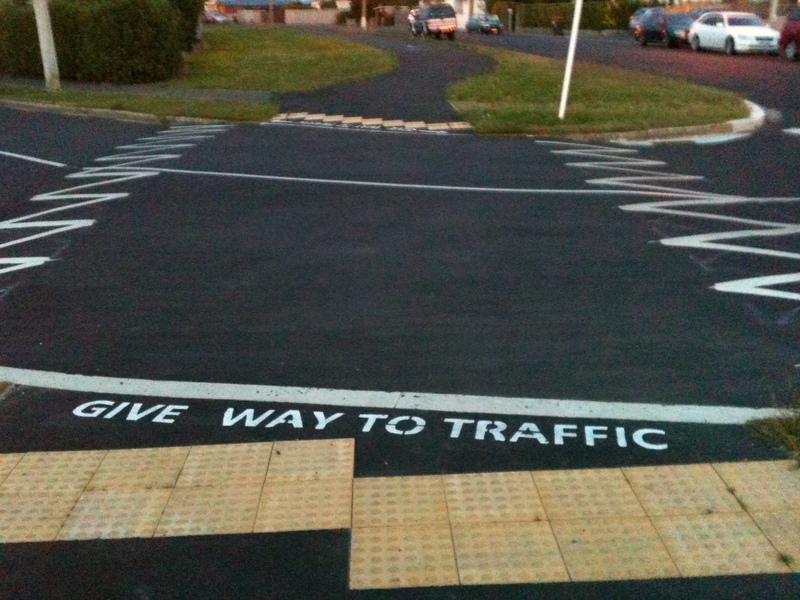 Meanwhile on the one-ways, NZTA continues to work on the SH1 separated cycle lanes plan. The detailed options should be presented to Council by the middle of 2015. We’ll be calling on you to speak out in support of this vital piece of urban cycling infrastructure when the time comes. Be ready to be heard! The Royal Crescent path is cruisy, but still treats cyclists as second class citizens by requiring them to yield to side traffic. 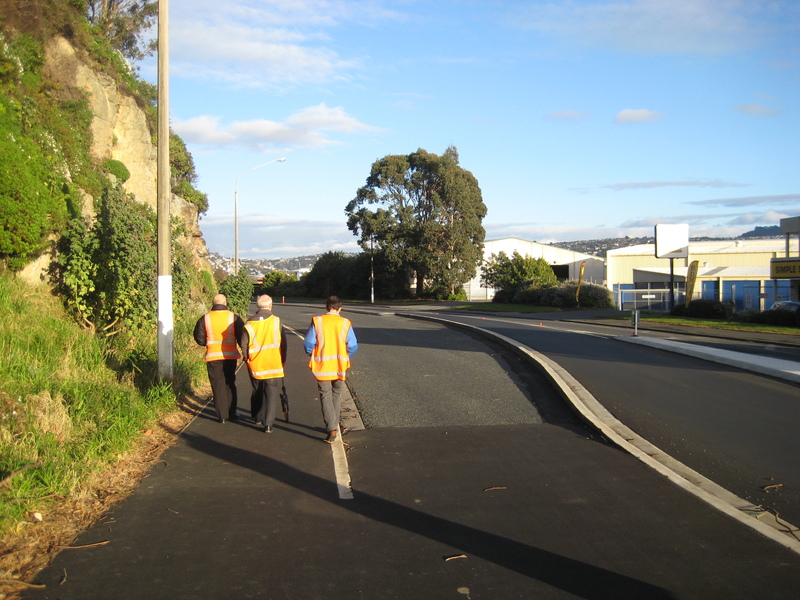 Success on the South Dunedin Strategic Cycle Network has been a bit more miss than hit over the last year, having been plagued with some poor designs and some poor implementation. The moderate successes to date include the much needed widening of the Portsmouth Drive shared path and the cycleway along Royal Crescent. But Spokes was forced to formally submit against several of the DCC’s designs during various consultation stages, including designs for Victoria Road, Moreau St, and Musselburgh Rise. Unfortunately, due to funding constraints, Victoria Rd and Musselburgh Rise (routes that actually need cycling infrastructure) have been dropped from the network altogether. 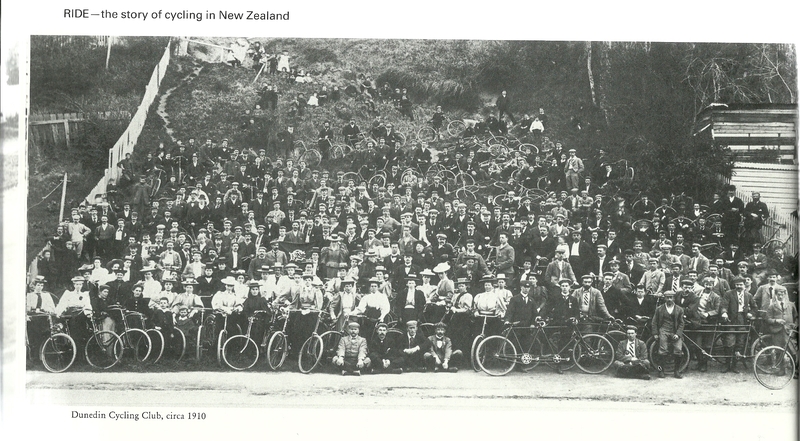 Many of the problems stemmed from a lack of early engagement, and an evident reliance on out of town consultants who didn’t seem to know much about Dunedin, or even cycling. For example, while the cycleway idea for the Portsmouth Dr to Andy Bay Rd section of S. Portobello Rd is a great idea, the implementation was bad. Had Spokes been given an opportunity to review the detailed design together with the AA, it’s possible we could have avoided the ongoing headaches there. However, DCC is taking steps toward better engagement. For example, the Harbourside Precinct Working Group of 2014 included representatives from Spokes, the AA, the police, fire and ambulance services, KiwiRail, and several business owners in the vicinity of the Roberts/Wharf intersection. Although the group suffered some teething problems, in the end everyone was able to communicate their concerns and we were able to find a solution that everyone agreed to (which still has to be implemented). This is the kind of model that should be pursued closer to the beginning of a project rather than at the end. Spokes has now met together several times with DCC, the AA, and business/property owners along S. Portobello Road to investigate better solutions there, and a stakeholder liaison group is being established for the one-ways project that will begin meeting in January 2015. Does this inspire you as an example of high-quality cycling infrastructure? The initial failure of the Portsmouth Dr to Andy Bay Rd section should provide some valuable lessons about how to build cycling infrastructure. Most importantly: cutting corners and trying to implement cycling infrastructure on the cheap could require costly remediation at a later date. We have repeatedly called for well-designed, high-quality, high-standard cycling infrastructure on fewer, but important, routes rather than widespread routes of poor quality or simply where it can be done most easily rather than where it is most needed. 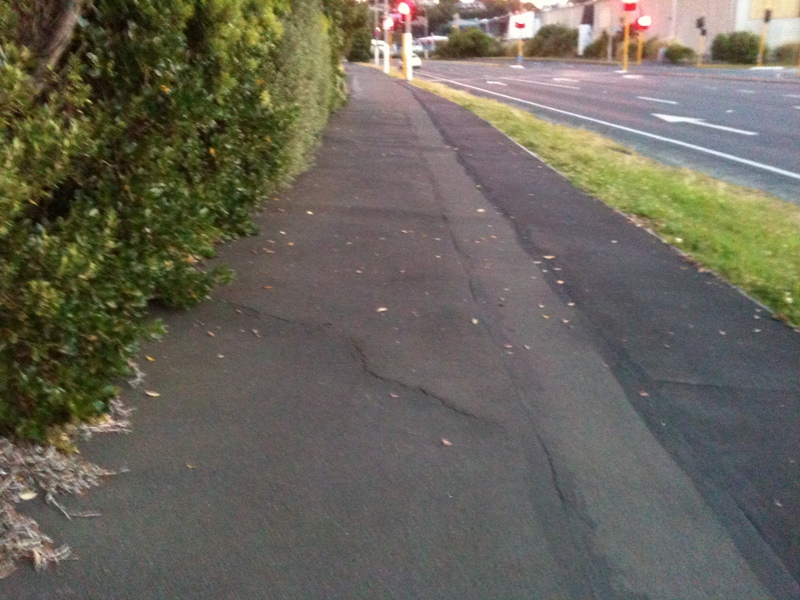 The half measures on S. Portobello Rd and the patchwork quality of the widened Portsmouth Drive and Tahuna shared paths create confusion and leave people with the impression of a job half done. We want every cycle route in Dunedin to be celebrated for its effectiveness for people on bikes, its quality of construction, and its ingenuity of design, and to serve as an inspiration for future work. 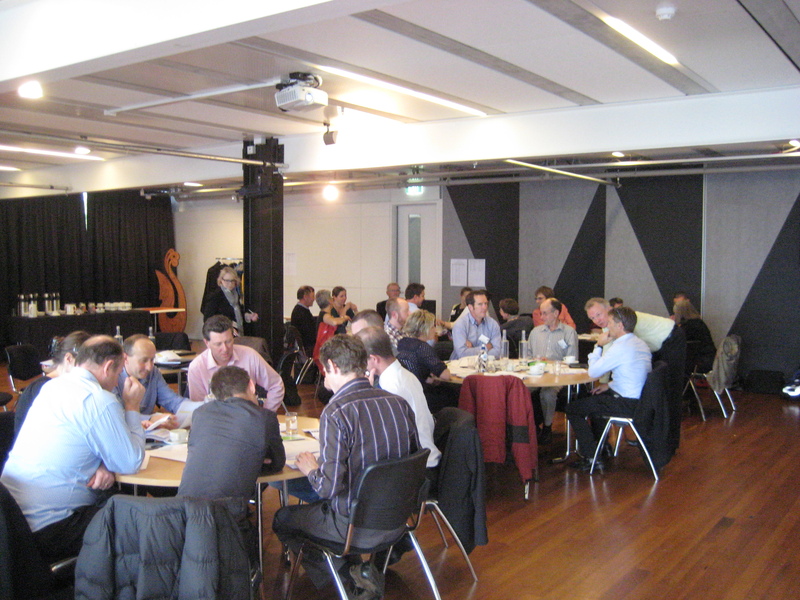 At the New Zealand Cycle Safety Summit in Wellington – investigating how to improve cycle safety for all NZ. Can you spot Olympic track cyclist Sarah Ulmer? Following the coroner’s report last year, the government tasked NZTA with forming a panel of cycle safety experts to provide recommendations on how to strategically improve cycle safety in New Zealand. Spokes Dunedin was invited to contribute to this process through a larger reference group that fed into the safety panel. In preparation for the first NZ Cycle Safety Summit in April, comprising the entire panel and reference group, Spokes asked the people of Dunedin for input on what they thought were the issues facing cyclists, the ODT helped by publicizing it, and dozens of people responded. Spokes Dunedin was the only organisation to ask for input from the public in this way! The final 82 page report of recommendations to the government is now available. Fantastic flyer for the Spokes-led nationwide GPS campaign, with awesome graphics by Generation Zero. The Government Policy Statement (GPS) on Land Transport is the document that sets out funding levels for transportation, including a category for walking and cycling infrastructure. Past funding levels for walking and cycling have been less than $20 million per year (for all of NZ! ), compared with $1.5 billion per year for roads and motorways. Spokes Dunedin initiated a submission campaign to ask for a very modest funding increase, and together with Cycle Action Auckland, Cycle Aware Wellington, and Generation Zero we mobilised over 3000 people from all across NZ to make a submission. Although our submission campaign did not achieve a GPS funding increase, it successfully elevated the national cycling profile. People in government, including the Prime Minister, are starting to appreciate the value of good cycling infrastructure, and during recent election campaigning all the major parties promised some kind of investment in urban cycling. The government has now allocated $100 million to be spent over four years in addition to the regular allocation through the GPS. To secure future funding and future increases in the GPS, it is crucial to demonstrate that this allocated funding can be successfully utilized within the 4-year timeframe, and to demonstrate that the outcomes are effective and of high quality. Dunedin has a large number of cycling projects with local or regional council backing. Several of these are already well advanced in their planning or implementation, including the Port Chalmers path, Portobello Road widening, SH1 separated lanes, and South Dunedin Strategic Cycle Network. 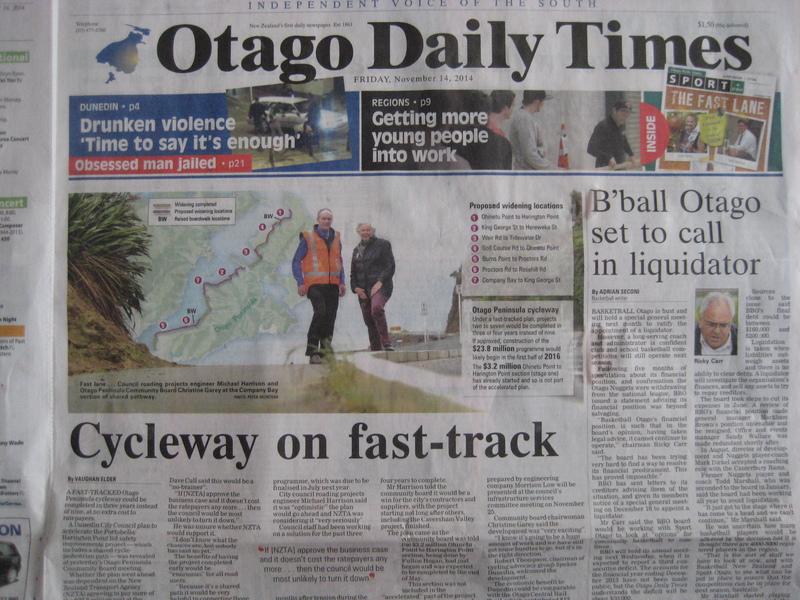 Because of this, Dunedin is very well positioned to benefit from the $100 million urban cycling fund, and I look forward to working hard in 2015 to ensure that Dunedin receives a fair share. 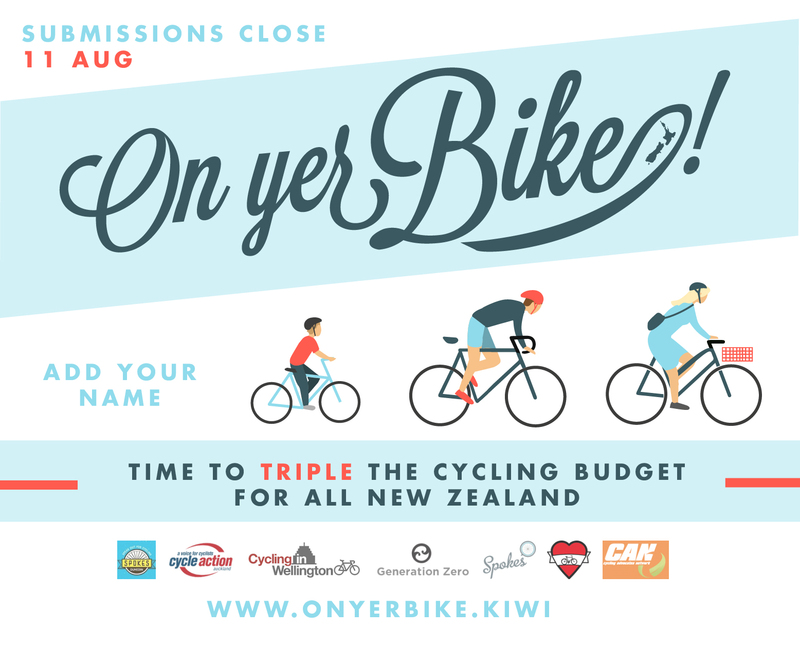 To sum up, the advanced state of our existing projects and the extra $100 million being provided by the government means that the next few years should bring real and significant change for cycling in Dunedin. As a result of people like you speaking out for cycling, the past couple years have seen a lot of planning and a taste of what’s to come. Here’s to making 2015 a year of on-the-ground change, and with your continued support we’ll make it happen. This entry was posted in All SPOKESd up, Infrastructure, Policy. Bookmark the permalink. 1 Response to 2014 year in review! That sums up 2014 nicely. Good job Robert.